This picture with annotation in Oriya has come to my hand from poet and socio-political activist Shankar Parida. Many of his FaceBook friends might also have got it. 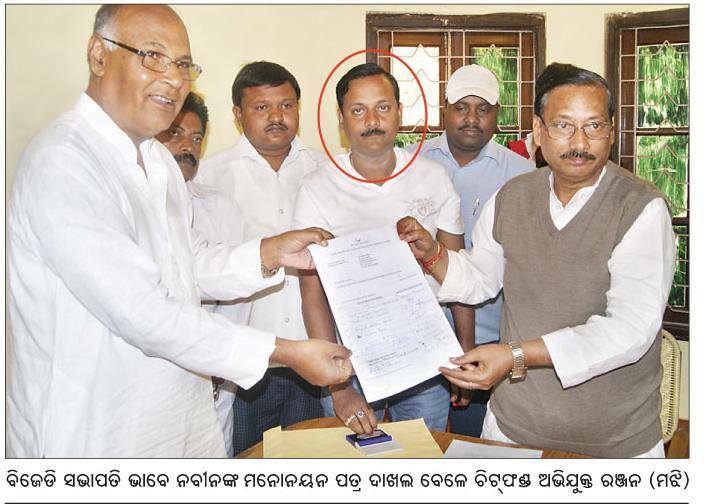 It shows that Chit Fund accused Ranjan was an integral part of Chief Minister Naveen Patnaik’s inner circle, whose prominent presence was a guiding factor behind filing of Naveen Patnaik’s nomination papers for the post of BJD President. He is seen, stamp in hand, authenticating the nomination. The picture is self-explanatory and massively suggestive. May the CBI take the cue and zoom in on the Chief Minister, as delay may give him contrive ways to escape. “Supreme court had given order for CBI investigation when records were produced that Artha-tattva had given 6 free flats to the then Police Commissioner Sri B K Sharma who is now ADGP Crime branch and investigating Chit fund scam. Police Commissioner could not allow this without matching flats to the then DGP Sri M M Prahraj who has got legal impunity like High court judge after retirement as Member of State Administrative Tribunal in ending moments of UPA Govt. But the original cause of CBI inquiry is not being looked into and officers leader combine is trapping only Ashok Mohanty who had taken a single house on payment. Ashok Mohanty also must be aware,but can he tell the secrets? He must be under assurance that matter will be pacified after a short period”. Mr. Upadhyay’s note is as apposite as pertinent. Who but the Chief Minister is GodFather of these officers? RTI activist Jayant Kumar Das has sent me chilling details of one of these two officers that makes me infer that the offense attributed to him could not have been carried out or gone unpunished without the blessings of the chief minister on his head. The CBI is doing discernibly excellent in penetrating into the felony. It must have drawn its roadmap to reach the crux. But, unless the Chief Minister is immediately brought into investigation, the nexus of the offenders is so unfathomably intricate that where, when and in which layer what evidence shall get lost may be totally impossible to locate. The Chief Minister may be immediately grilled on his connection with Ranjan. And, that is why in course of time I have developed my personal respects for you. You are a great discovery and a strong object of my appreciation, even though I know, in many matters we shall differ. Kind regards. For many of us in the legal profession, sans this particular episode, Ashok Mohanty is considered as a good and respectable soul. On account of his communist back ground, he is a little too strung and sensitive but had maintained a very clean record. It is not as though he had not held any governmental position before becoming the advocate general. He was earlier Sr Standing Counsel for commercial tax department and Sr Standing Counsel for the Indian Railways. Nobody had raised any allegation with regard to his integrity. I would refrain from formulating any opinion on this particular episode since the matter under investigation and the courts are seized of the matter. Suffice to say that , ” A Picture Speaks 20-Thousand Words “. This article, therefore, could have been of shorter length with a simple one liner request, ” C. B. I. pl. INVESTIGATE THE PICTURE FROM ALL ANGLES-360 “. I felt it is absolutely prudent on my part to suggest that you and your editorial board should do some kind of investigative journalism before going full guns blazing on persons like Ashok Mohanty. He has dedicated his entire 70 years of his life standing against anything unfair ( please do believe me on this) and it’s absolutely surreal ( in a way) to see a man like him being dragged through all this muck. Before stroking your pen you should have thought, there has only been outgo of money from his bank account, where is the inflow? AND DO YOU SERIOUSLY BELIEVE THAT HE WOULD DO THIS FOR JUST 30 lakhs indian rupees. So I would again you to rethink, and apply your journalism cap in a better way and stand for the truth and downtrodden. The sharks are still swimming in the waters, and by the way they belong to all the political parties. No body has the guts to make them fall by their noses, not even journalists like you. I know how the investigative agencies are….have you forgotten the “caged parrot” analogy? Enough for now, it’s a sunny morning here,I am off to the 49th street for a coffee. Yes Sir, on the 49th st near Lexington Ave., as I remember, Manhattan Espresso café offer excellent copy and there can be nothing more desirable than enjoying it in a sunny morning, particularly when the a drizzle has just past or expected. I am thankful to you for your kind words on Sri Asok Mohanty, whom I also love and respect in my personal life. It was actually very painful on my part to mention him in these pages, and as memories of having watched him in various progressive forums in the past were not leaving me, it was really painful to pen whatever you have referred to. Yet, it was beyond avoidance as emerging data necessitated the mention. Believe me, in your words, I feel, as if I have addressed myself in context of Mr. Mohanty. But, frankly, I sometimes also write against myself, as people have a right to be informed. Good Morning and Thank you Mr Pattanayak for posting a promt response. I must appreciate your magnanimous words when you say “I am thankful to you for your kind words on Sri Asok Mohanty, whom I also love and respect in my personal life”. It’s only journalists who have a spine (read who are good human beings) who can say that. My point is very simple, if people like yourself and me do not stand by Mr Asok Mohanty, who many of us believe has been framed by the agency as he is a naive man, we can’t justify our own existence before the almighty. I would urge you to a) first believe yourself after questioning the data in hand (LIKE THERE HAS BEEN NO INCOMING FUNDS TO HIS ONLY BANK ACCOUNT), and b) If you believe, please start to show support for a innocent man through your most powerful weapon, your pen. I am sometime a cynic and a non believer , but in this particular case I am very hopeful that progressive and right thinking persons like yourself will come in support of Mr Mohanty. ITS REALLY SAD THAT IN INDIA, when someone like me posts something on a serious issue, such as the injustice on Mr Mohanty, and things go eerily silent. I’ve often thought that maybe it’s just me. Maybe I don’t have the right words, or skill, or credibility, or whatever it is, to shine any real light on such a dark issue. Maybe I should just back off and leave it to others who do. Maybe I should offer support in quieter, less noticeable ways. But sometimes God grips your heart in such a way that staying silent is NO LONGER AN OPTION. So even if I do it awkwardly, ineffectively, inconsistently–or even just plain badly–I’m going to SPEAK OUT FOR MR ASOK MOHANTY. You have a good day Sir.